We have organised a bus to collect guests from Coig Na Shee at 2pm and at the The Glen Hotel soon after (which is across the road from Dower House Hotel). In the evening, a bus will take guests back to their hotels in Newtonmore from Glentruim at 11pm, 12pm and 1am respectively. Let us know if you think you’d like to go back earlier and we’ll add an additional trip! The dress code is Cocktail Attire, so suits for men and dresses for women (we had to Google it as well…!). Highland dress is also welcome. The weather should be around 15-18 degrees during the day and 5-10 degrees at night, depending on the sun. The ceremony and dinner will take place indoors, but the drinks reception will hopefully be on the lawn - weather permitting. We recommend bringing a layer to stay warm. We’ll also provide umbrellas in case the Scottish weather wishes to greet you. Having you spend they day with us is the perfect gift. We ask for nothing more! From 2pm onwards please join us at the Wedding Lodge at Glentruim Estate for a welcome drink before the ceremony. Guests are asked to arrive by 2:30pm latest so that they have time find their seat and settle in. 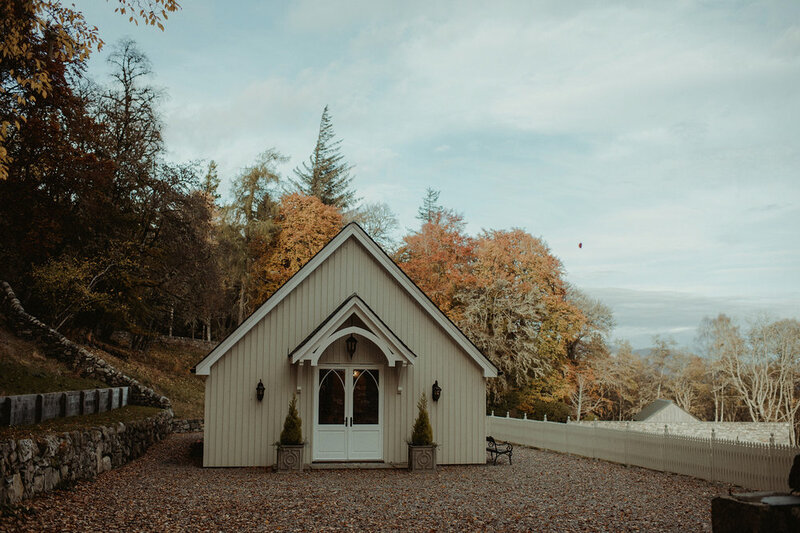 The ceremony will take place in the Wedding Lodge, located on the grounds of Glentruim Estate. It is a short walk through the gardens on a gravel path (maybe not the best for stilettos!) After the ceremony we will take some photos outside of the Lodge and enjoy a glass of bubbly to celebrate. The best part! Drinks and canapés will be served on the lawn of Glentruim Estate, where we’ll also have some lawn games set up. We’ll be off taking some photos in the grounds with our lovely photographer Hayley, but you can bet that we won’t be away from the snacks for too long. We’ll be serving beer, bubbly and a cocktail - but feel free to head over to the bar indoors for anything stronger! From 5pm onwards we invite you to wander into Glentruim’s Orangery, where we will have tables set up for dinner. Guests are invited to take their seats for our entrance followed by speeches from the Father of the Bride (Diederik) and the Best Man (Nicky). Dinner will be served as a series of sharing platters, catered by The Pantry from Edinburgh! Wine & beer will be provided, but do head over to Glentruim’s bar for something a bit stronger. After the main course we’ll hear speeches from the Father of the Groom (Matt Sr.) and the Maid of Honour (Zuzu). 8:00pm until late - Sparklers, cheese & dessert! After dinner we’ll all wrap up and head outside to take some fun sparkler photos around the fire pits and set off sky lanterns. We’ll have an open bar from 8:30pm onwards, and will have music playing across the entire house - so feel free to take the party into any one of the beautiful lounges or out by the fire pit! At 10:30pm a cheese buffet will be set up with a littttle surprise snack. We’ve hired the entire estate so we can stay as late as we like! Busses will take guests back to their hotels in Newtonmore from 11pm-1am.